Monsanto is building a new soybean breeding facility in South Dakota. They broke ground just this week in fact. The 17,500-square-foot site will have an initial permanent staff of two and a seasonal staff of up to 10 part-time employees. South Dakota Governor Mike Rounds said that Monsanto’s plans in this area — coming so soon after the opening of its corn breeding facility — has positive implications for the state’s bio-tech and agricultural industries. 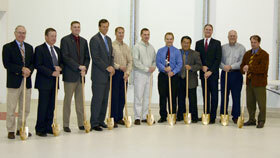 From left to right: Jay Van Den Top and Craig Hagen (both representing Harrisburg Industrial Park); Clint Turnbull (Monsanto); Senator John Thune; Mike Hawbaker and Brian Ternus (both of Monsanto); Jon Klemme and Jeff Eckhoff (both representing Lincoln County Economic Development Association); South Dakota Lt. Governor Dennis Daugaard; Harrisburg Mayor Reed Ramsted, and Rob Everist (representing Harrisburg Industrial Park).